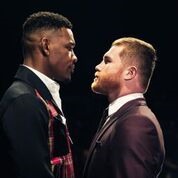 With current WBA, WBC and Lineal Middleweight champion Canelo Alvarez (51-1-2, 35 KOs) showdown with fellow champion, IBF belt holder Daniel Jacobs (35-2, 29 KOs) less then a month away, Canelo took sometime to address several topics including how difficult this matchup will be and how much he is looking forward to it. In 54 professional fights Canelo has faced just about everything in the ring. From gifted boxers in Floyd Mayweather and Erislandy Lara to power punchers in GGG and Julio Cesar Chavez Jr, Canelo has faced them all. His matchup with Jacobs however, could pose him an entirely new threat. Canelo has never faced someone that not only has the supreme boxing skills that Jacobs possesses but also the ability to end the fight at any point with his power. Canelo, admitted as such. “I believe Jacobs has a unique style. He is an opponent that is very complete. He can box, punch, tall, he’s agile but I’ve fought all the styles out there. I believe at my level with my experience, you put it in front of me and I can adapt and adjust.”. It’s true, Canelo has seemingly been able to adjust to just about any style. He has after all graced the ring with numerous hall of famers. With that being said, Jacobs could present him with his most difficult challenge to date. For Canelo, these challenges fuel him to no end. He does not simply want to be one of the best boxers today but one of the very best in history. Fans are always looking ahead. Assuming Canelo gets past Jacobs which by all means is no guarantee, they want to know what is in his immediate future. A third fight with GGG is rumored to be next on his agenda. Canelo made it clear what would have to happen in order for a third fight to happen against GGG this year. Unifying the titles seems to be the number one agenda for Canelo Alvarez in 2019. Before he can achieve that goal he will need to get pass Daniel Jacobs come Cinco De Mayo in what could be his toughest opponent.